The transport industry has been connecting its assets to the internet longer than most, but the rapid growth in sensors enables much greater sophistication that just tracking dots on a map. GPS capabilities and smartphone integration via Bluetooth are now par for the course, but innovative technology is continuing to transform this highly regulated and competitive industry. With the rise of the Internet of Things (IoT), the ‘auto’ in automobile is rapidly becoming a reality. The development of drones and self-driving delivery trucks are the next stage of innovation for the transport sector. 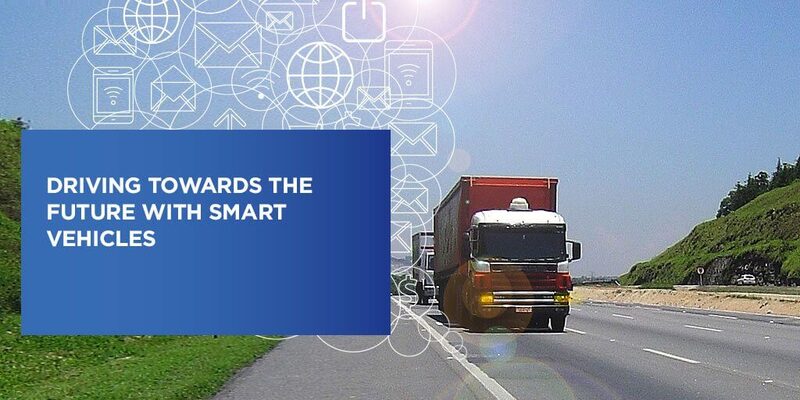 Increasingly, vehicles will communicate with each other and their surrounding environment, making our roads safer and improving business productivity. This kind of innovation is a game-changer for anyone managing a fleet of vehicles. The transport industry is fraught with challenges for operators, as they try to meet strict government regulations and cut costs with little visibility into their fleet. For those managing thousands of drivers and machines, the ability to track every element of a journey will transform operational efficiency and significantly reduce unnecessary costs. The data provided by sensors will enable fleet managers to record crucial metrics like weight, speed, fuel consumption and even specific driver behaviors like harsh braking. For professional drivers, vehicles are considered places of work. Driver safety is highly regulated in the transport industry, and a key concern for anyone managing a fleet. Driver behavior and issues with vehicles can both play a role in road accidents, and sensors have provided operators with greater opportunities to closely monitor vehicle use and identify areas of concern. You can track vehicle performance to prevent mechanical failure and monitor driving hours to ensure rest breaks are being taken. Drivers can receive a notification to alert them when they need to take a break, or let them know if a vehicle issue has been detected. The next step for the industry will be to embrace biometrics, which will use wearables to detect when a driver is suffering from fatigue, by tracking eye moment or brain activity. This kind of innovation will have a significant impact on the number of injuries and fatalities caused by unsafe driving behaviors. The adoption of IoT technology will also have overall business benefits for transport operators. In particular, fitting vehicles with sensors will help fleet managers to reduce operational costs by monitoring driver behavior. In the past, dangerous or careless behavior might have gone undetected, but telematics offer the ability to monitor things like harsh braking and acceleration, which lead to excessive wear and tear and maintenance costs. You can notify drivers in real-time that they need to slow down, or are in danger of breaching a safety policy. Better driving practices will also reduce fuel bills and can be used to lower insurance premiums. With greater visibility, businesses are better placed to develop and enforce safe driving policies. Service-based businesses will see huge benefits from IoT technology, with sensors enabling them to improve customer experience through faster, more efficient delivery. With real-time insight into scheduling and product tracking, operators can work out the best routes for drivers and help them get to and from jobs more quickly. Tracking vehicles along their journey will also help improve customer service because customers can be notified immediately if there are any issues. More efficient routes will also help to reduce fuel costs and boost revenue, by increasing the number of jobs that can be done in a day. The transport industry will achieve even greater efficiency as self-driving vehicles become a reality. Sensors can help vehicles communicate with each other, the road they’re driving on and other sources of information to find the best routes. Connected drone technology is also developing rapidly, which is expected to displace $13 billion of business services and human labor in the transport sector. Drones will also provide real-time monitoring and address safety issues by removing the need for humans to perform dangerous tasks. These IoT applications will cause massive disruption for the transport sector, transforming the way organizations do business. Download our free e-book to learn more about how you can drive business efficiency with IoT applications.